Gives yours a cut back now to keep it neat and tidy. A well-grown wisteria trained on a house or pergola looks great all year round, especially in late spring when in full bloom. 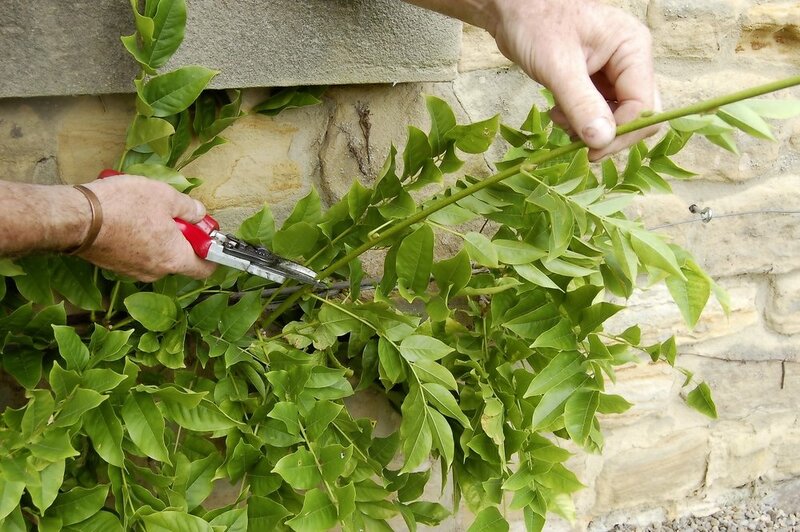 When established, wisteria make strong growth and unless they are trained and pruned on a regular basis they can soon become a tangled mass of twisted stems. Ideally, they prefer a sunny position such as a south or west facing aspect. In this situation the shoots will ripen in the late summer sun to induce flower buds for the following year. When training a young plant, the long growths will need tying to a trellis or wires to form a permanent framework of branches. Excessive growth will need thinning and where possible as many branches as possible should be trained horizontally to encourage flowers. After flowering in late spring the plant goes into growth mode and over the summer long, whippy stems will be produced. It’s these long growths that need pruning back at this time of the year to tidy up the plant and maintain the trained shape. If not pruned, the plant will very quickly become overgrown. Although wisteria prefers a sunny spot, this year some plants have suffered in the heat and dry conditions. Where plants are looking stressed and the leaves are drying out, give the roots a good soak to keep the plant ticking over.